All papers listed below with underlined titles are clickable links that will take you directly to the pdf version of the paper. For all other papers, please refer to Research Gate, or send us a request by email: smartlab@psych.ryerson.ca. Russo, F. A., & Ammirante, P. (2018). Music perception. In J.T. Wixted & J. Serences (Eds.) Volume 2 of Stevens’ Handbook of Experimental Psychology and Cognitive Neuroscience: Sensation, Perception, and Attention (pp. 317-342). New York, NY: John Wiley & Sons. Behar, A., Chasin, M., Mosher, S., Abdoli-Eramaki, M., & Russo, F. A. (2018). Noise exposure and hearing loss in classical orchestra musicians: A five-year follow-up. Noise and Health. Peck, K., Girard, T. A., Russo, F. A. & Fiocco, A. J. (2016). Music and memory in Alzheimer’s disease and the potential underlying mechanisms. Journal of Alzheimer’s and Dementia, 51, 949-59. doi:10.3233/JAD-150998. Kirchberger, M.,& Russo, F. A. (2016). Dynamic range across music genres and the perception of dynamic compression in hearing-impaired listeners. Trends in Hearing, 20, DOI: 10.1177/2331216516630549. Kirchberger, M., & Russo, F. A. (2016). Harmonic frequency lowering: Effects on the perception of music detail and sound quality. Trends in Hearing, 20, DOI: 10.1177/2331216515626131. Nespoli, G., Singh, G., & Russo, F.A. (2016). Skin conductance responses to emotional speech in hearing-impaired and hearing-aided listeners. Proceedings of Acoustics Week in Canada. Canadian Acoustics, 44, 184-185, Vancouver, BC. Lauzon, A., Russo, F. A., Harris, L. (2016). There’s something about that groove: Rhythm improves detection of audio but not vibrotactile asynchronies. Proceedings of Acoustics Week in Canada. Canadian Acoustics, 44, 186-187, Vancouver, BC. Goy, H., Pichora-Fuller, M. K., Singh, G., & Russo, F. A. (2016). Perception of emotional speech by listeners with hearing aids. Proceedings of Acoustics Week in Canada. Canadian Acoustics, 44, 182-183, Vancouver, BC. Russo, F. A., Thompson, W. F., & Cuddy, L. L. (2015). Effects of emergent-level structure on melodic processing difficulty. Music Perception, 33, 96-109. Good, A., Russo, F. A., & Sullivan, J. (2015). The efficacy of singing in foreign-language learning. Psychology of Music, 43, 627-640. Royal, I., Lidji, P., Theoret, H., Russo, F. A., & Peretz, I. (2015). Excitability of the motor system: a transcranial magnetic stimulation study on singing and speaking. Neuropsychologia, 75, 525-532. Ammirante, P., & Russo, F. A. (2015). Low-skip bias: The distribution of skips and leaps across the pitch ranges of vocal and instrumental melodies is vocally constrained. Music Perception, 32(4), 335-363. McGarry, L. M., Pineda, J., Russo, F. A. (2015). The role of the extended MNS in emotional and non-emotional judgments of human song. Cognitive, Behavioral and Affective Neuroscience, 15, 32-44. Kirchberger, M. J., & Russo, F. A. (2014). Development and validation of the Adaptive Test for the Assessment of Music Perception. Ear and Hearing, 36, 217-228. Nespoli, G., Ammirante, P., & Russo, F. A. (2014). Musicians show enhanced neural synchronization at multiple timescales. Proceedings of Acoustics Week in Canada. Canadian Acoustics, 42, 74-75. Behar, A., Segu, R. & Russo, F. A. (2014). Comfort from hearing protectors. Proceedings of Acoustics Week in Canada. Canadian Acoustics, 42, 64-65. Nespoli, G., Behar, A., & Russo, F. A. (2013). Validation of the CSA Z107.56 standard method for the measurement of noise exposure from headsets. Canadian Acoustics, 41, 31-36. Russo, F. A., Behar, A., Chasin, M., & Mosher, S. (2013). Noise exposure and hearing loss in classical orchestra musicians. International Journal of Industrial Ergonomics, 43, 474-478. Sandstrom, G. M., & Russo, F. A. (2013). Absorption in music: A scale to identify individuals with strong emotional responses to music. Psychology of Music, 41, 216 – 228. Chan, L., Russo, F. A., & Livingstone, S. (2013) Automatic facial mimicry of emotion during perception of song. Music Perception, 30, 361-367. Vempala, N., & Russo, F. A. (2013). Exploring Cognitivist and Emotivist positions of musical emotion using neural network models. Proceedings of the International Conference on Cognitive Modelling. Kirchberger, M., Russo, F. A., Derleth, P., Hofbauer, M. (2013). Development of a new series of tests to assess the effectiveness of hearing aids for the perception of music. Proceedings of the ASA/CAA/ICA, Journal of the Acoustical Society of America, 133, 3366. Russo, F. A., Ammirante, P. & Fels, D. I. (2012). Vibrotactile discrimination of musical timbre. Journal of Experimental Psychology: Human Perception and Performance, 38, 822-826. Vempala, N. N., & Russo, F. A. (2012). Predicting emotion from music audio features using neural networks. Proceedings of the 9th International Symposium on Computer Music Modeling and Retrieval (CMMR). Lecture Notes in Computer Science, London, UK. Livingstone, S. R., Palmer, C., Schubert, E. (2012). Emotional response to musical repetition. Emotion, 12, 552-567. Russo, F.A., Sandstorm, G.M. & Maksimowski, M. (2011) Mouth versus eyes: Gaze fixation during perception of sung interval size. Psychomusicology: Music, Mind & Brain, 21(1-2), 98-107. Ammirante, P., Thompson, W.F., & Russo, F. A. (2011). Ideomotor effects of pitch on continuation tapping. Quarterly Journal of Experimental Psychology, 64,381-393. McGarry, L. M., & Russo, F.A. (2011). Mirroring in Dance/Movement Therapy: Potential mechanisms behind empathy enhancement. Arts in Psychotherapy, 38,178-184. Sandstrom, G.M., & Russo, F. A. (2010). Music hath charms: The effects of valence and arousal on the regulation of stress. Music and Medicine, 2, 137-143. Karam, M., Branje, C., Udo, J. P., Russo, F. A., & Fels, D. I. (2010). Comparing Computer Versus Human Data Collection Methods for Public Usability Evaluations of a Tactile-Audio Display Evaluating a tactile display in a public setting. Journal of Usability Studies, 5,132-146. Quinto, L., Thompson, W.F., Russo, F.A., & Trehub, S. (2010). A comparison of the McGurk effect for spoken and sung syllables. Attention, Perception & Psychophysics, 72,1450-1454. Thompson, W. F., Russo, F. A., & Livingstone, S. (2010). Facial expressions of singers influence perceived pitch relations. Psychonomic Bulletin & Review, 17,317-322. Easa, S., Reed, M. J., Russo, F. A., Dabbour, E., Mehmood, A., & Curtis, K. (2010). Effect of increasing road lighting luminance on night driving performance for older adults. International Journal of Applied Science, Engineering and Technology, 6,41-48. Karam, M., Branje, C. J., Russo, F. A., Maksimowski, M., & Fels, D. I., (2010). Vibrotactile display of music on the human back. Proceedings of the International Conferences on Advances in Computer-Human Interactions. Karam, M., Russo, F. A., & Fels, D. (2009).Designing the model human cochlea: An Ambient crossmodal audio-tactile display.IEEE Transactions on Haptics, 2,160-169. Yang, L., Reed, M. J., Russo, F. A., & Wilkinson, A. (2009). A new look at retest learning in older adults: learning in the absence of item-specific effects. Journal of Gerontology: Psychological Sciences, 64,470-473. Livingstone, S., Thompson, W.F., & Russo, F. A. (2009). Facial expressions and emotional singing: A study of perception and production with motion capture and electromyography. Music Perception, 26,475-488. Russo, F. A. (2009). Multimodal and mulitdimensional integration in music. Guest Editorial. Canadian Acoustics, 37, 3-4. Ceaser, D., Thompson, W. F., & Russo, F. A. (2009). Expressing tonal closure in music performance: Auditory and visual cues. Canadian Acoustics, 37,29-34. Russo, F. A. (2009). Towards a functional hearing test for musicians: The probe tone method. In M. Chasin’s (Ed.) Hearing Loss in Musicians.San Diego, CA: Plural Publishing, pp. 145-152. Goy, H., Ives, D.T., Russo, F. A., Pichora-Fuller, M. K., Patterson, R. D. (2009). Changes in Melodic Perception as a Function of Age and Lowest Harmonic Component. Proceedings of Acoustics Week in Canada, Canadian Acoustics, 37,184-185, Niagara-on-the-Lake, Canada. Branje, C., Maksimowksi, M., Nespoli, G., Karam, M., Fels, D., Russo, F. A. (2009). Development and Validation of a Sensory-Substitution Technology for Music. Proceedings of Acoustics Week in Canada, Canadian Acoustics, 37,186-187, Niagara-on-the-Lake, Canada. Branje, C., Karam, M., Fels, D. I., Russo, F. A. (2009). Enhancing entertainment through a multimodal chair interface. Proceedings of the IEEE TIC Science and Technology for Humanity Conference,636-641, Toronto, Canada. Karam, M., Nespoli, G., Russo, F. A., & Fels, D. I. (2009). Modeling perceptual elements of music using a vibrotactile display: A Field study. Proceedings of the International Conferences on Advances in Computer-Human Interactions,Cancun, Mexico. Russo, F. A., & Pichora-Fuller, M. K. (2008). Tune-in or tune-out: Age-related differences in listening to speech in music. Ear and Hearing, 29,746-760. Thompson, W. F., Russo, F. A., & Quinto, L. (2008). Audio-visual integration of emotional cues in song. Cognition & Emotion, 22, 1457-1470. Easa, S., Reed, M., & Russo, F. A. (2008). What do Psychology and Civil Engineering have in common to promote well-being and excellence? Canadian Civil Engineer, 25,14-18. Russo, F. A. (2008). The experience of relative pitch. Canadian Hearing Report (Canadian Academy of Audiology), 3,27-28. Maksimowski, M. & Russo, F. A. (2008). Cross-modal integration in music perception. Proceedings of Acoustics Week in Canada, Canadian Acoustics, 36,102-103, Vancouver, Canada. Patel, A., Tierney, A., & Russo, F. A. (2008). Empirical comparisons of pitch patterns in music, speech, and birdsong. Proceedings of the 10th International Conference on Music Perception and Cognition,Sapporo, Japan. Tierney, A., Russo, F. A., Patel, A. (2008). Empirical comparisons of pitch patterns in music, speech, and birdsong. Proceedings of the 155th Meeting of the Acoustical Society of America. Journal of the Acoustical Society of America, 123,3721, Paris, France. Karam, M., Russo, F. A., Branje, C., Price, E., & Fels, D. (2008). 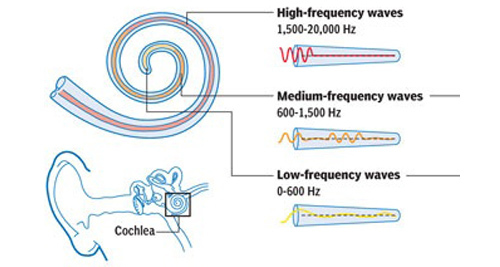 Towards a model human cochlea. ACM International Conference Proceeding Series (Graphics Interface, 2008), 322,267-274, Windsor, Canada. Cuddy, L. L., Russo, F. A., & Galembo, A. (2007). Tonality of low-frequency synthesized piano tones. Archives of Acoustics, 32, 541-550. Russo, F. A., & Jones, J. A. (2007). Urgency is a non-monotonic function of pulse rate. Journal of the Acoustical Society of America, 122,EL185-190. Thompson, W.F. & Russo, F. A. (2007). Facing the music. Psychological Science, 18,756-757. Russo, F. A., Cuddy, L. L., Galembo, A., & Thompson, W. F. (2007). Sensitivity to tonality across the piano range. Perception, 36,781-790. Lu, Z., Abdoli-E., Russo, F. A., & Pushchak, R. (2007). Impact of the background noise on preferred sound levels in Personal Stereo Players. Proceedings of the Association of Canadian Ergonomists, 38th Annual Conference, Toronto, Canada. Russo, F. A., Abdoli-E., M., Lu, Z., & Jelen, A. (2007). A field study of preferred listening levels for music played on personal stereo players. Proceedings of Acoustics Week in Canada, Canadian Acoustics, 35,82-83, Montreal, Canada. Minghella, D., Russo, F. A., & Pichora-Fuller, M. K. (2007). Effect of age on sensitivity to tonality. Proceedings of Acoustics Week in Canada, Canadian Acoustics, 35,58-59, Montreal, Canada. Russo, F. A., & Jones, J. A., (2007). Human factors considerations in the design of rumble strips. Proceedings of the Canadian Multidisciplinary Road Safety Conference XVII,Montreal, Canada. Russo, F. A. (2006). Perceptual considerations in designing hearing aids for music. Hearing Review, 3,74-78. Melnik, G.M., Russo, F.A., & Popkin, S. (2006). The effect of locomotive horn characteristics on motorist detection. Proceedings of the Ninth International Level Crossing Symposium,Montreal, Canada. Russo, F. A., Vuvan, D., & Thompson, W. F. (2006). Setting words to music: An empirical investigation concerning effects of phoneme on the experience of interval size. Proceedings of the 9th International Conference on Music Perception and Cognition,Bologna, Italy. Thompson, W. F., & Russo, F. A. (2006). Facial expressions of pitch structure. Proceedings of the 9th International Conference on Music Perception and Cognition,Bologna, Italy. Thompson, W. F., & Russo, F. A. (2006). Pre-attentive integration of visual and auditory dimensions of music. Proceedings of the 2nd International Conference on Music and Gesture,Manchester, U.K.
Russo, F. A., & Thompson, W. F. (2005). The subjective size of melodic intervals over a two-octave range. Psychonomic Bulletin & Review, 12,1068-1075. Thompson, W. F., Graham, P., & Russo, F. A. (2005). Seeing music performance: Visual influences on perception and experience. Semiotica, 156,203-227. Russo, F. A., & Thompson, W. F. (2005). An interval-size illusion: The influence of timbre on the perceived size of melodic intervals. Perception & Psychophysics, 67,559-568. Chasin, M., & Russo, F. A., (2004). Hearing Aids and Music. Trends in Amplification, 8,35-47. Galembo, A., Askenfelt, A., Cuddy, L. L., & Russo, F. A. (2004). Perceptual significance of inharmonicity and spectral envelope in the piano bass range. Acta Acustica, 90,528-536. Thompson, W. F., & Russo, F. A. (2004). The attribution of meaning and emotion to song lyrics. Forum Psychologiczne, 9,119-127. English, G. W., Russo, F. A., Moore, T. N., Lantz, M. E., & Schwier, C. (2004). Locomotive horns: Influence of position and sound characteristics on effectiveness. Proceedings of the 8th International Level Crossing Symposium,Sheffield, U.K.
Russo, F. A., Windell, D. L., & Cuddy, L. L. (2003). Learning the Special Note: Evidence for a critical period for absolute pitch acquisition. Music Perception, 21,51-62. English, G. W., Russo, F. A., Moore, T. N., Lantz, M. E., & Schwier, C. (2003). Locomotive horns evaluation: Effectiveness at operating speeds. Transport Canada Report (Reference Number: TP14103E). Russo, F. A., Lantz, M. E., English, G. W., & Cuddy, L. L. (2003). Increasing effectiveness of train horns without increasing intensity. Proceedings of the 2003 International Conference on Auditory Display,51-54, Boston, USA. English, G. W., Russo, F. A., Moore, T. N., & Lantz, M. E. (2002, November). Locomotive horn study. Paper presented at the Fourth Workshop on Highway-Railway Grade Crossing Research,Montreal Canada. Galembo, A., Askenfelt, A., Cuddy, L. L., & Russo, F. A. (2001). Effects of relative phases on pitch and timbre in the piano bass range. Journal of the Acoustical Society of America, 110,1649-1666. Russo, F. A., & Cuddy, L. L. (1999). Motor theory of melodic expectancy. Invited lay-language paper for Press Room of the 137th Meeting of the Acoustical Society of America. Russo, F. A., Galembo, A., & Cuddy, L. L. (1998, May). Perception of tonality across the tessitura of an instrument. Proceedings of the European Society for the Cognition of Music.Rome, Italy. Russo, F. A., & Cuddy, L. L (1998, May). Toward a motor theory of melodic perception. Proceedings of the European Society for the Cognition of MusicRome, Italy. Russo, F. A., Galembo, A., & Cuddy, L. L. (1997, October). Evaluation of perceived tonality across the musical pitch range. Proceedings of the Canadian Acoustical Association, Canadian Acoustics, 25,35, Windsor, Canada. Russo, F. A., & Cuddy, L. L. (1996, August). Perceptual cues to melodic organization. Proceedings of the XXVI International Congress of Psychology, International Journal of Psychology, 31,263-264, Montreal, Canada. Russo, F. A., & Cuddy, L. L. (1996, August). Predictive value of Narmour’s principles for cohesiveness, pleasingness, and memory of Webern melodies. Proceedings of the Fourth International Conference on Music Perception and Cognition,439-443, Montreal, Canada. Thompson, W. F., & Russo, F. A., & Sinclair, D. (1994). Effects of underscoring on the perception of closure and intensity in film excerpts. Psychomusicology, 13,9-27. Thompson, W. F., Russo, F. A., & McKinnell, A. (1993, October). Musical influences on the perception of time. Proceedings of the Canadian Acoustical Association, Canadian Acoustics, 21,83-84, Toronto, Canada.